When you preserve lemons or the similar Japanese yuzu citron in honey, you get to enjoy the sweet and tangy flavor. Try this classic Japanese tsukemono, or pickled product, mixed together with hot water for a warming beverage or use the lemon pieces in a hot tea or mixed together with a vinegared dish for a subtle sweetness. While it's simple to throw together, you'll have to wait two to three weeks to use it. Wash and dry a container that it is large enough to fit several lemons. Rinse the lemons and scrub off any dirt or debris. Pat the lemons dry with a clean kitchen towel. Cut the lemons into 1/4-inch-thick slices, discarding both ends of each fruit. Remove the seeds from the lemons. Arrange the lemon slices in the container, leaving little room between each. Pour honey over the top of the lemons until they are covered completely. Cover the container and place it in your refrigerator for two to three weeks. Serve. Use organic lemons to remove the worry about pesticides that might be on the rind. Thin the honey with hot water for a warming beverage and add the lemon pieces to tea to impart a sweet lemon flavor. If you can buy yuzu citron, a Japanese fruit similar to a grapefruit, try this preparation with it. Do not feed honey to children under 1 year of age. 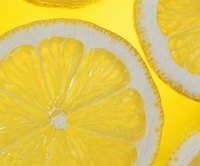 How Long Can a Lemon Be Safe in Water?